In this prequel film to 'The Transformers' film series, this movie opens on the planet Cybertron as a fierce battle rages on between the good Autobots and the evil Decepticons. Optimus Prime (voice of Peter Cullen) blasts away foes as he calls in assistance from B-127 (voice of Dylan O'Brien). The small Autobot comes in beating the Decepticons until Optimus tasks him with a mission. They head toward a launch pad so that Optimus can send B-127 to planet Earth for refuge and to help establish a base for the Autobots. The Decepticons rush over to destroy the launch pad, but B-127 makes it off Cybertron in time while Optimus stays to keep fighting. The year is 1987 in the California town of Brighton Falls. Charleen 'Charlie' Watson (Hailee Steinfeld) wakes up and goes to meet her family; her mother Sally (Pamela Adlon), brother Otis (Jason Drucker), and stepfather Ron (Stephen Schneider). Charlie hasn't gotten over the passing of her father and has not fully accepted Ron as part of the family. She then goes to work at a carnival where her co-worker Memo (Jorge Lindeborg, Jr.) tries to get her attention because he has a crush on her, but she just ignores him. Charlie then accidentally spills lemonade on a guy from school and is mocked by the popular girls led by Tina (Gracie Dzienny). Later at home, Charlie tries to fix up a car that she had been working on with her father, but she becomes discouraged and feels that she can't do it on her own. We cut to a training exercise involving paint balls between Sector 7 agents. Agent Jack Burns (John Cena) boasts his win to his peers, just moments before they see B-127 come crashing down to the ground. 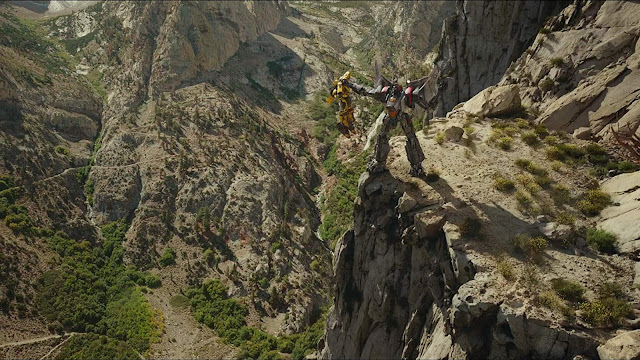 As he rises to his feet, the agents go after the Autobot and chase him until he's cornered. B-127 speaks and says he doesn't want to hurt the agents. However, a real threat arrives in the form of Blitzwing (voice of David Sobolov), who fires upon the agents before chasing after B-127. Blitzwing catches him and demands that he give up the whereabouts of Optimus and the other Autobots. B-127 says he'll never talk, so Blitzwing makes it official by ripping out his voice box and then dropping him down the side of a cliff. He then tries to kill B-127, but the little guy manages to throw a grenade at Blitzwing and use his blaster to obliterate the Decepticon. B-127 grows weaker as his systems start to shut down and his memory core starts failing. He then scans a Volkswagen Beetle before shutting down. Charlie goes by her Uncle Hank's (Len Cariou) garage to help out, when she spots a yellow Beetle. Since it's her birthday, she asks for the car. When Hank won't budge, Charlie offers to work at the garage for a year, but Hanks relents and lets her take it home. Charlie drives the car home and hides it from her mom in the garage. She notices something fall from her the car, so she looks underneath and sees B-127's face. He reacts quick and takes on his Autobot form. Charlie lets him know she is not going to hurt him, and he appears to trust her. Since he can't talk anymore, he makes a buzzing sound, which Charlie says sounds like a bumblebee, so she decides that his name will now be Bumblebee. However, Charlie activating Bumblebee also causes a signal to go out across the galaxy. Two Decepticons, Shatter (voice of Angela Bassett) and Dropkick (voice of Justin Theroux), are interrogating the Autobot Cliffjumper (voice of Andrew Morgado) on Optimus's whereabouts until they get a read on Bee's signal. Dropkick slices Cliffjumper down the middle as he follows Shatter to Earth. Elsewhere, a redneck couple, Roy (Lenny Jacobson) and Amber (Megyn Price), argue because Roy spent the rent money on a new car. They look up in the sky to see a falling object, and Roy tries to protect his car, but the object hits a truck. A second falling object comes down and not only destroys Roy's car, but the gas station behind it. Shatter and Dropkick then emerge from the craters and stand before the couple. Dropkick liquidates Roy before the two head off on their mission. In the morning, Charlie goes to the garage to greet Bumblebee, but finds that he's gone. She freaks out and asks Otis if someone took the car, and he says that Sally took it to take their dog Conan to the vet. Charlie rides her bike and chases after her mom as Bumblebee sticks his arm out, and she orders him to stop. Charlie manages to stop Sally and makes up an excuse so that she can drive the car. At Sector 7 HQ, a young Agent Simmons (Nick Pilla) brings information to Burns on energy readings that just came in. Burns leads other agents, plus Dr. Powell (John Ortiz), to a site where they meet Shatter and Dropkick. Shatter tells the agents that they are there for Bumblebee, claiming he is a fugitive and that he must be captured. Against Burns's better judgment, the agents agree to help the Decepticons track Bumblebee down. Charlie takes Bee to the beach so that she can let him know that he has to maintain his disguise around anybody who isn't her. 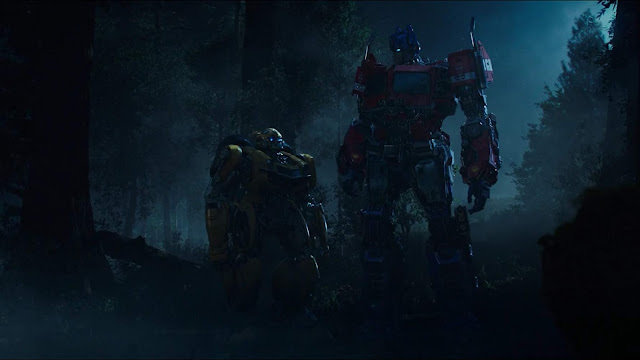 She takes him into the woods to try and fix something inside him, and she ends up activating a message from Optimus, which is to remind Bee to aid in bringing the Autobots to Earth, as well of the ongoing Cybertronian civil war. It triggers a flashback in Bee for when he was escaping Cybertron as he watched Optimus fight off Shockwave, Soundwave, and Ravage. Charlie brings Bee home so that she can help him communicate through his radio. She tries a few tapes, like The Smiths and Rick Astley, but Bee rejects them. Outside, Memo tries to knock on Charlie's door to finally talk to her, but he ends up seeing Bumblebee as an Autobot, and it doesn't help when he transforms into a Volkswagon car right in front of him. Charlie tells Memo not to freak out, and she makes him promise to keep this knowledge between the two of them. The Sector 7 agents allow Shatter and Dropkick to access their technology and create a connected web of information with their own advanced gear. Burns rightfully doesn't trust the Decepticons, and his commanding officer allows him to do what he wants with the bots once they have found and captured Bumblebee. Charlie goes ahead to work on the other car while Bee watches "The Breakfast Club" and becomes amused by the famous fist pump shot. He goes for another tape, but he grabs a tape labled "Charlie's Dive Meet". Charlie gets upset and turns it off because that was the last time she saw her father, as he was the one recording it. She tells Bee that he died of a heart attack and that she never got to say goodbye, and she thinks that fixing the car will be like preserving a piece of him, but she can't fix it and feels helpless. Charlie breaks down as Bee comforts her. Later on, Memo joins Charlie and Bee as they head out for the day. They go by a cliff-side where Charlie's classmates are hanging out. The guy who she spilled lemonade on recognizes her, but instead for knowing her as a diver. He challenges Charlie to jump off the cliff and into the water, but as Charlie gets ready to do so, she backs out, as she is reminded too much of her father. Tina goes to her car to taunt her and cruelly bring up Charlie's father. Memo then proposes they get revenge. Later that night, they go by Tina's house to throw toilet paper all over it. They show Bee how to get in on it, but he just throws all the rolls over the house. They then get some eggs to pelt Tina's car with. Bee manages to throw all the eggs onto the car, but he gets carried away and then proceeds to stomp on Tina's car and completely wreck it. Charlie and Memo hop inside Bee before Tina comes outside to see that her car is now a pancake. While Charlie is at work, Bee follows Conan through the doggy door. He ends up inside the house, making a huge mess of things before sticking his finger in an electrical socket, which causes a shortage that blows up the transformers outside. This also sends out an Energon signal that Shatter and Dropkick pick up, which alerts the Sector 7 agents to Bee's whereabouts. Memo sees the chaos outside and calls Charlie, urging her to come home. She does so and sees the mess that Bee made, and she scolds him, scaring him but apologizes. Sally later comes home to find the place a mess and she begins to chastise Charlie for whatever happened, thinking she is acting out. Charlie hits back that she hasn't been able to find happiness and move on since her dad died unlike Sally. Charlie leaves with Bee and Memo. They are discovered by the agents and are promptly pursued. Bee tries to protect Charlie, but he gets tased, and so does she. Bee is taken into Sector 7, leading Charlie and Memo to go rescue him. Shatter and Dropkick pick at Bee's body until they find the message from Optimus. Once they realize that the Autobots are coming to Earth, they decide to contact the other Decepticons to also come to the planet so they can kill their enemies, along with the humans. Dr. Powell overhears them and tries to warn Burns, just before Dropkick liquidates Powell as well. 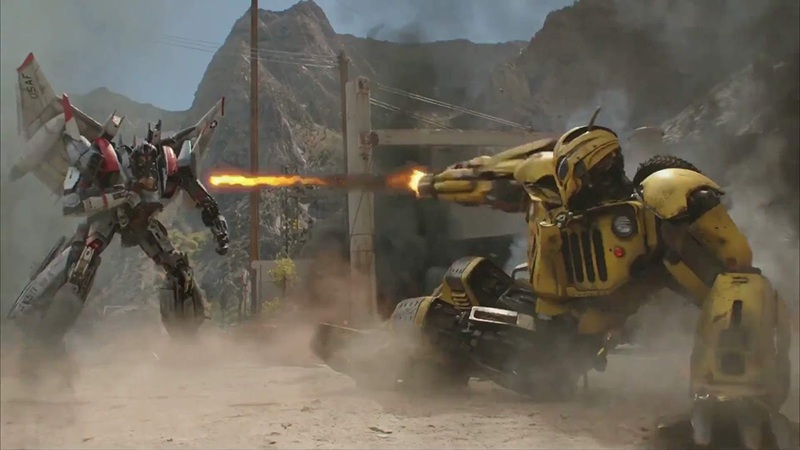 The Decepticons appear to kill Bumblebee as well before they head off to make contact. Charlie and Memo run to Bee and grab electric guns to try and give him electricity to bring him back. It appears to not work at first, but Bee rises up and Charlie hugs him. The electric shocks also bring back all of Bee's memories. The three step outside, only to be confronted by the agents. Burns orders them to fire on Bee to restrain him. When he sees that Charlie is in danger, Bee musters up his strength to fight back against the agents. He ends up becoming fueled with rage as he fires back on the agents, severely injuring them until Charlie tells Bee to stop because she knows he is not a killer. Bee backs down and takes Charlie with him to go stop the Decepticons. Memo tries to join her, but she tells him to stay behind, and she leaves him with a kiss on the cheek. Otis is forced to tell Sally where Charlie is, so she has Ron drive out to find her. They end up in a chase alongside Bee and Charlie as they are pursued by more agents. Bee and Charlie manage to get away while Ron narrowly avoids crashing and getting struck by the other oncoming cars. Otis finds the whole near-death experience awesome until he pukes. Shatter and Dropkick prepare to use a device on a tower to send out a call to the Decepticons. Charlie heads up the tower to remove the device while Bee fights Dropkick. The Decepticon uses his weaponry against Bee, but the Autobot grabs a chain and wraps it around Dropkick. With one swift pull, Bee tears Dropkick to pieces. Shatter then tries to kill Charlie, but Bee swoops in to save her. Burns also attempts to fly in with his helicopter during the chaos, but is attacked by Shatter. Before he crashes, Bee catches and saves Burns. He continues to fight Shatter as Charlie pulls off the device from the tower. Just when it looks like Shatter has the upper hand, Bee fires a blast that breaks a dam. Bee grabs Shatter and holds her as a ship crashes into them, destroying Shatter and sending Bee to the bottom of the water. Charlie dives in and helps him out. Burns finds them and allows them to leave, now having respect for Bumblebee. 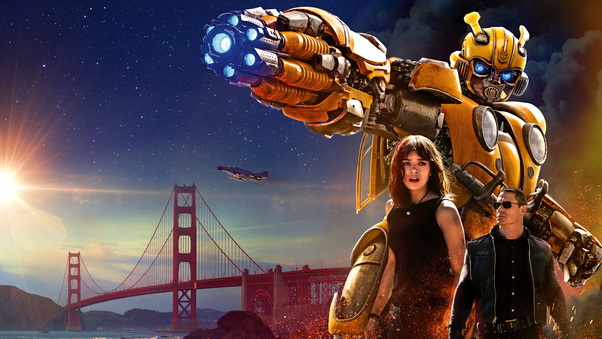 Charlie brings Bee just outside of San Francisco to part ways, knowing that Bee's fellow Autobots need him just as Charlie has people there that need her. She tearfully says goodbye to Bee, and he hugs her back. He then scans a Camaro and takes that form before he heads off. Charlie returns home where a crowd is gathered after the events that happened. She reunites with her family, hugging Sally, sincerely thanking Otis for letting his parents know where she was, and showing Ron some respect. Memo then joins her and tries to hold her hand, but she tells him they're not quite there yet. Optimus meets Bumblebee on Earth where he tells his leader his new name as they await the arrival of the other Autobots. Meanwhile, Charlie finally fixes up her dad's car and takes it out for a spin.